As is the case elsewhere in the state, Kauai’s visitor industry is keeping the island’s economy afloat while other sectors continue to recover from the recent recession, Hawaii Pacific University economist Leroy Laney said Thursday. “If all parts of the Kauai economy were doing as well as tourism, the entire island would be booming,” Laney said in an address to First Hawaiian Bank’s 38nd Annual Business Outlook forum at the Kauai Marriott Resort. Visitor spending, which is up 21 percent on Kauai through the first seven months of the year compared with 2011, is on track to continue its upward trend with Alaska Airlines adding four flights a week from Portland, Ore., this fall, and with the Kauai Visitors Bureau pushing forward with a revitalization project on the east side, Laney said. Kauai’s reputation as one of the world’s “top island destinations” has been bolstered by recent renovations of several hotels and positive publicity from movies shot on Kauai, such as “The Descendants,” according to Laney. Hotel occupancy rates are very strong by historical standards, Laney added. The St. Regis Princeville on Kauai’s north shore was more than 90 percent full this summer, as were major time-share destinations there, including the Westin and the Wyndham, Laney said. 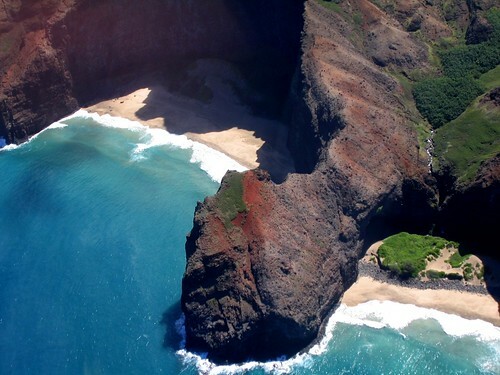 Aerial view of Kauai’s coastline. Photo by Justin Donnelly. Outside of tourism there are signs of improvement in the island’s real estate and seed corn sectors, Laney said. Record-low mortgage rates and falling real estate prices have drawn more buyers into the market, although some sales are the result of foreclosure proceedings. In addition, the Kauai Board of Realtors reported that the number of real estate agents has been increasing after several years of declines. The number of jobs, including those in the construction industry, remains below its pre-recession peak, Laney said. And the unemployment rate, while moving downward slowly, is still historically high at 7.8 percent. Projects on the drawing board that could provide an impetus include the Kilauea Lighthouse Village, a 47,000-square-foot shopping mall, and a Safeway-anchored shopping center at Hokulei Village.